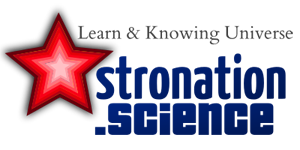 Astronomy Science ~ Hubble back taking pictures that all stunning astronomical object. This time he took the image of the largest planet in the Solar System Jupiter who have eyes that look straight at the middle of the Hubble telescope. It turns out the mysterious giant eye formed by the shadow of one of the satellites of Jupiter Ganymede who was passing by and appear on the surface of the gas planet. Uniquely, the shadow is located just above the giant red spot of Jupiter while NASA immortalize. As we know, the giant red spot of Jupiter actually is a giant storm sized 10,000 miles or 16 thousand kilometers more. This storm alone has been observed by scientists since 150 years ago. The unique view photos, then likens Jupiter NASA as one of the one-eyed creatures of Greek myth, the Cyclops. 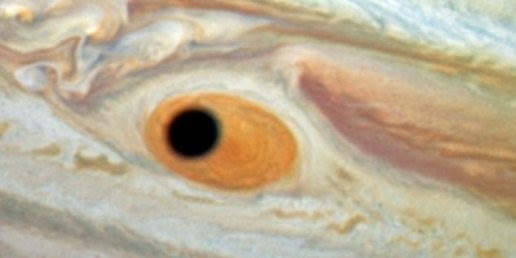 "At first glance, Jupiter seemed to stare back toward the Hubble telescope, like a one-eyed giant Cyclops," said NASA. NASA also states when they inadvertently perpetuate the image currently conducting research on the giant red spot of Jupiter. NASA indeed curious why these days the size of the spots has narrowed. Jupiter red spot was previously known to frequent changes in size, but never as small as today. Then, right on 21 April 2014 and the shadow of one of Jupiter's moons, Ganymede, appearing suddenly. It makes Jupiter as if having eye.